Let’s set the scene: You’ve recently added some new content that you’ve downloaded to the My Memories Suite program directories and you can’t wait to get in and make some fantastic new scrapbook pages with them.Â You start up the software and rush in to browse in the new directory you’ve created where all the new content is stored. As soon as you do, an error message pops up. Something about a corrupted file. Annoyed, you click ‘OK’ and realize that you were able to “bypass” the error and still access the files after clicking ‘OK’, but the error keeps popping up and you have to click ‘OK’ for all of the errors before you can use anything in that directory. Every. Single. Time. Ouch. Thanks to a helpful Pink Toque Craft Blog reader, Cam, we now have a resolution straight from My Memories Suite customer service that fixes the problem.Â And the answer is so simple I keep wondering why I never bothered to call them myself. Apparently Windows Vista doesn’t like to play nice with My Memories Suite. (Wait, Vista isn’t 100% compatible with everything? NO WAI!) You know how when you go browsing for scrapbooking items such as backgrounds or embellishments within the software and you see various thumbnails there to choose from? The first time you browse new content to use within the software that My Memories Suite hasn’t accessed before, the program renders thumbnail versions of every single image file in the new directory when you browse in it right then and there — backgrounds, embellishemnts, etc. — so that when you are browsing your options you have a little preview thumbnail image of the items to choose from.Â The error comes into play when you’ve added new content, go to browse it within MMS and you use Windows Vista, as Vista doesn’t like to render the thumbnails properly, hence the error message. The error is basically just letting you know that the thumbnail isn’t present and it can’t be rendered, but it forgets to mention that it’s all Vista’s fault. I know you’re thinking, “Great, Lesley, but how do we FIX it?” Well, after adding new content to your My Memories Suite software, be it additional content you’ve created or you’ve downloaded from others, (See my tutorial on how to add additional content HERE) you need to right click on your shortcut to launch My Memories Suite and choose “Run as Administrator” from the popup menu. If you run MMS as an administrator and THEN go in and browse the new content you added, My Memories Suite will render the thumbnails properly. My Memories Suite only needs to render thumbnails once — the first time the program accesses the new stuffÂ — and then the thumbnails will always be there. So this is why right after adding new content you may get errors for certain embellishments. You will continue to get those errors every time you run My Memories Suite afterwards until those thumbnails are created properly.Â Once the thumbnails are rendered, the errors will go away. You will only need to run My Memories Suite as an administrator once after adding new content to your software directories.Â If later on down the road you add more new content, be sure that the next time you run My Memories Suite that you run it as an administrator and then go browse to the new content so that the thumbnails for the new files are made correctly, and you’ll be good to go. If you ever run into the error while you’re working within the software, simply save what you’re working on, exit out of the program, and restart My Memories Suite, being sure to run it as an administrator. Then go back to the directory you were trying to access before and the errors should be gone. The only part of this that still doesn’t make sense to me is how Vista decides which files it cannot render properly. Sometimes I get the error after adding new content but other times I don’t get any errors at all. Sometimes it’s not the entire contents of the new directory I’ve added, just a few select files among an entire folder of new stuff that produces the error. Previously I believed it affected files that were small in size or too small of a resolution to be used properly within MMS.Â I was fairly regularly getting the error on tiny items or very thin ribbons, which tend to be a lot of pixels wide but only a few pixels tall and I thought that was the contributing factor.Â Perhaps that is part of it; perhaps the reason Vista is having issues rendering these thumbnails has to do with file sizes, dimensions or resolutions. But the most important part to note is that it is not an error or problem with My Memories Suite; it is a Windows Vista problem. 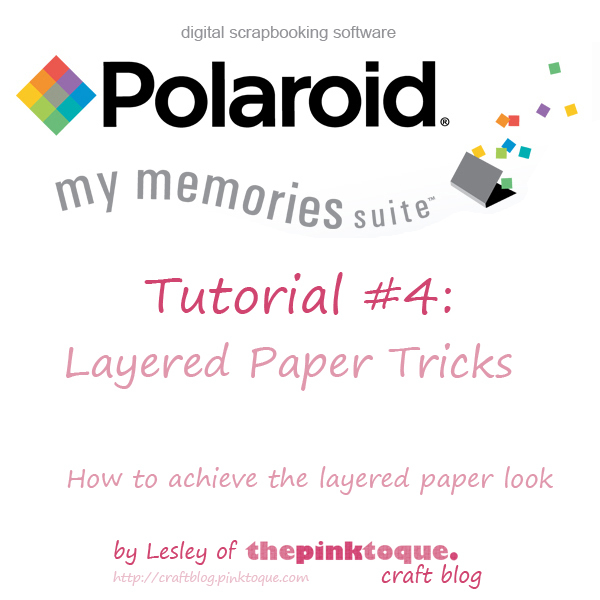 This fourth installment of my tutorial series shows you how to achive the layered paper look within the program.Â Not only does it show you how to layer background papers but it also shows you how you can turn those simple square or rectangular background papers into various shapes, too, when you layer. If you’d rather watch this on YouTube so you can bookmark it to watch when convenient, head on over to YouTube, where you can also choose to watch in high quality. Hope you enjoy this latest tutorial and it helps you out.Â If you have any questions, please don’t hesitate to ask here by replying on the thread or send me an email: craftblog at pinktoque dot com.Â Oh and special thank to all of you that enjoyed and downloaded my The Road Not Taken quick page on Friday.Â Glad you liked it! :)Â Have a great week! My latest tutorial for My Memories Suite is ready to go!Â Today’s tutorial, the third in the series, teaches you how to use quick pages within the My Memories Suite software.Â The tutorial assumes that you have already watched tutorial 2 and understand how to add additional content to your program’s directories (which you must do to add quick pages) and then how to physically use quick pages you’ve added within My Memories Suite.Â It’s a quick and simple video this time (under 8 minutes, whew! ), and I’ve put it over at YouTube since YouTube will allow you to watch in high quality and bookmark it for later use. Need a quick page to use as a test when you follow along with the video? Nab my “Thankful for You” quick page from Sunday — it’s a great way to show off the things you’re thankful for this season :) Happy scrapping! The second installment of the My Memories Suite tutorial series that I’ve been working on is ready for view!Â This time around I address adding additional content such as freebies or other graphics to the program’s directories for use within the software.Â This allows you to use digi scrapping freebies (or ANY image files such as clip art from the internet, things you design yourself OR even items you scan!) in My Memories Suite just as if it were pre-loaded content. The fact that My Memories Suite allows you to use any and all common image files (such as .JPG or .GIF or .PNG) means that your possibilities with the software are endless.Â While the program comes with tons of pre-loaded backgrounds, embellishments, etc. one day you’ll want to add more, and it’s very easy to do as you can see in Tutorial 2.Â You’re not just limited to adding just digi scrapping freebies, either.Â In this tutorial I show you how to add a typical digital scrapbooking freebie kit and how you can scan personal mementos like movie stubs or concert ticket stubs and add them the same way so that you can digitally scrap with physical mementos you’d normally paste in a traditional scrapbook.Â The sky’s the limit with My Memories Suite, and I’m here to show you how easy it is to make the software your own.Â Easily add downloaded freebie kits from DigiFree or scan physical objects such as a napkin from your friend’s wedding or a greeting card you’d normally scrap traditionally and use it within My Memories Suite digitally instead! This is the second tutorial in the My Memories Suite software tutorial series and is roughly 18 minutes total in length.Â You can check it out over on YouTube where you can bookmark it, download it and save it just in case you don’t have all 18 minutes to spare all at once. Â If anything is unclear, just let me know!Â I have plans for at least 3 other tutorials as well.Â If you missed the first tutorial, which was an introduction to the software’s basic features and capabilities, click here.Â Each new tutorial piggybacks off of the previous videos, so you’ll want to watch them all!Â Stay tuned for more tutorials in the near future, and if you have any suggestions for future tutorials (wondering if My Memories Suite can do this or that? Just ask!) drop me a line and let me know; if it’s not already something I’m planning to do, I’d be happy to make more. And thanks for the kind comments on yesterday’s Tags and Scraps freebie; I’m glad you enjoy them! :) See you back soon for more goodies.Â Take care! I’ve received a few emails over the past several months asking me some more specific questions about the digital scrapbooking software I use: My Memories Suite by Polaroid. Â One of the more recent emails I got asked a lot of good questions that I realized isn’t very obvious based on the website ad and video. Â They’re more technical use questions that aren’t modeled on the infomercial or explained on the site for someone who may be trying to check out the program’s capabilities before buying. Â Now that I have been using this amazing software for nearly a year, I felt inspired to create some video tutorials that cover some of the more important aspects of the program and some of the common questions I’ve been asked about it. Â Today I’m releasing my first freebie software tutorial, which is a basic introduction. Â In this video I do a 30 minute walkthrough of the program’s main features and show you the basic capabilities of My Memories Suite. Â The video is embedded below, or you can click here to watch the video over on YouTube, where you can bookmark it and rate it to come back to in case you don’t have 30 minutes all at once to spare. I hope that the video goes into enough detail to give you a better idea of how powerful My Memories Suite is, and perhaps even encourage you to purchase it for yourself. Â I couldn’t possibly rave more about how much I love it! 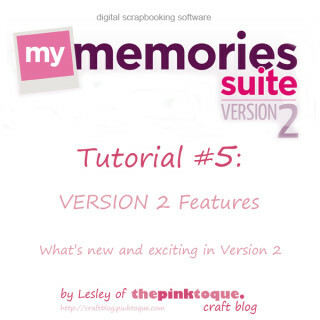 Â And if you’re a newcomer to the pink toque craft blog, you may wish to read my review of My Memories Suite here. Â Stay tuned, I have FOUR additional tutorial videos planned for this software that I will make and release as soon as I can :) Â And speaking of upcoming things to release, I have so many freebie goodies coming very soon! Â I’ll go ahead and announce that my next freebie will be a 3 day extravaganza starting this Friday (Freebie Friday!) in honour of the start of the new hockey season. Â If you’re a Calgary Flames fan, you won’t want to miss it! And WOW! Thanks to all of you that downloaded my CU paper edgers freebie the other day — they seem to be quite popular :) And I really appreciate all of the kind comments <3 Â I hope to make some more CU items in the future, too. Â Enjoy the tutorial and I’ll see you back in a few days for the hockey special Freebie Friday!